Follow up thoughts on "I would never say...(Part Deux)....."
I've received a number of excellent questions regarding my thoughts on the Alibaba SEC investigation. Rather than try to address my readers questions individually, I thought I'd take some time within this post to discuss the general themes contained therein. The following are common threads of my readers inquiries. 1.) How long do you think the investigation will take and how significant will the findings be? 2.) Why has the stock price held up so well? 3.) Should I short it? Let me be clear, I do not give Investment advice within this blog. I accept no compensation from anyone re: any of my commentary. My observations are mine and mine alone. I have no "inside contacts" at any of the businesses discussed herein, although I do have friends in the Peoples Republic of China (PRC) off whom I bounce my ideas off of from time to time. My modus operandi is simply to read the filings and SEC correspondence and interpret them based on sound judgment and reasoning developed over my years of accounting and investing experience. If I have any positions in any of the investments discussed, I'll disclose the position. Moreover, I have neither current nor had past positions in any of the individual stocks discussed within this blog. In any case, whatever you decide to do with my input, I wish you the best of luck! "Why has the stock price held up?" Oddly, in this business, you can be absolutely "right" about a stock, but Mr. Market might not agree with you for ten years. Unfortunately, again, in this business, being "right" in ten years has the same financial repercussion as being "wrong" for a decade. On the other hand, it's worth pointing out that when fraud is discovered, stocks can tumble very, very quickly, Enron or Valeant style. It's not like the stock slides neatly 3% per month for 36 months. Investors who are waiting for the "perfect" time to short the stock may find that when the whiff of fraud becomes unmistakable, many of the long investors will get out very quickly and not wait for the full post-mortems. For investors who short a stock, "no one rings a bell at the top". A: "DT, you are a complete moron and here's why......(insert well thought out commentary here.)" Moreover, if I happen make a mistake in my analysis, math or documentation, I'd like to know about it. You'd have my gratitude for pointing out my error(s). B: "DT, you are a F-ing moron....(with no explanation as to your thought process)"
I seem to be getting more correspondence similar to B than A lately. If you've read Thaler's "Nudge" or "Misbehaving" (I recommend both books. Each is an easy, informative read. Note that Rich is fully capable of delivering higher levels of math that would make your head spin and put you to sleep, but thankfully, for the sake of book sales, he's spared us the exercise, although the citations are fully available in the footnotes.) you've been armed with the knowledge that people/investors tend to develop all sorts of irrational, emotional "biases" toward a particular stock or investment. Moreover, they tend not to sell it nor listen to reasonable arguments as to why their initial assessment (which was a hot tip from their commission-only broker) might be dead wrong. They cling to their original thought process, like a dog to a bone, defending it and inevitably riding the stock all the way to the bottom. "Buy the dip baby!" They become emotionally invested. Their hubris, success and prior experience tells them that they can't possibly be wrong. They are smarter than everyone else. (See Thaler's survey describing how every respondent stated they were well above the average intelligence of their classmates.) In short, they've made up their minds and don't want to be "confused by the facts". Given the above 80% insider holdings, lets take a look at the top twenty shareholders who've presumably purchased their shares on the open market. Here's a list of non-insiders per Yahoo! Finance. 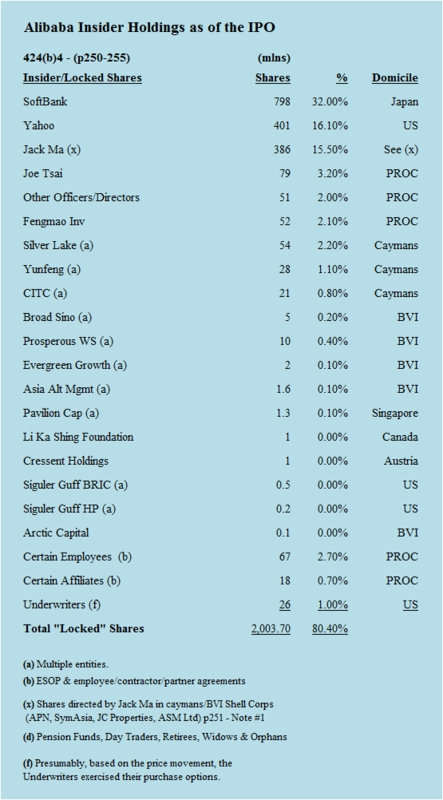 So today, an additional 14% of the company is owned by the above 20 funds/investors. 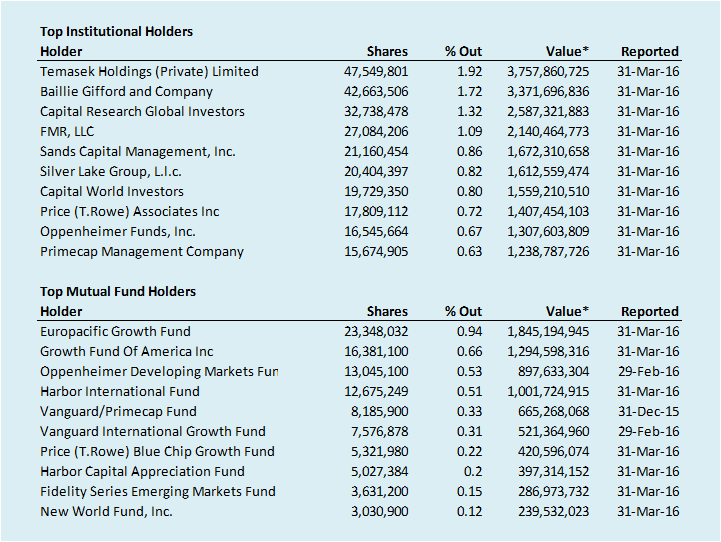 Note that these funds are generally not considered to be quants or day-traders. These are longer term, buy-and-hold investors. So that leaves roughly 5% of the outstanding shares (125 million shares give or take) available for trading by "little-guy" investors on any given day. Not much in the grand scheme of things. 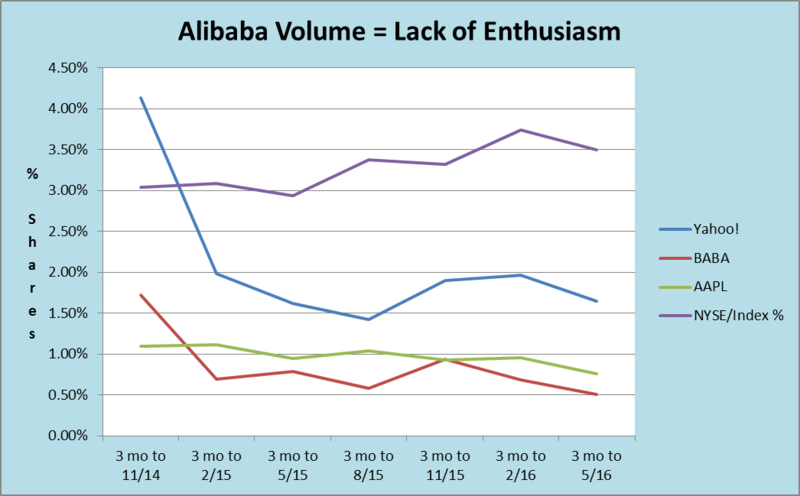 Now, lets take a look at volume trend for Alibaba. The chart below represents the average daily volume, calculated in three month periods for Yahoo!, BABA and AAPL as a percentage of their issued and outstanding shares. The NYSE "index" is simply the quarterly volume divided by a constant to show the change in trading volume for the entire market over the same period of time. BABA volume has dropped off substantially since the IPO, Average Daily Volume has decreased from 1.75% (45 million shares) to 0.50% (12 million shares) in that time.. This decrease in "enthusiasm" has persisted even though NYSE average daily volume has consistently increased over the same period. Yahoo! average daily share volume has generally mirrored BABA's, but at about three times the relative percent of shares outstanding. The value of BABA is being determined by a relatively few number of shares changing hands. There are about 2.5 Billion shares outstanding and only a few million shares are exchanged in arms length transactions daily. Don't get me wrong, I'm not a conspiracy theorist by nature. I'm not wearing an aluminum foil hat or looking over my shoulder right now. I'm just pointing out that with daily volume that low, in relative terms, with tremendous wealth spread out over a number of insider controlled businesses, and the insider necessity to keep the collateral value as high as possible, it wouldn't be that difficult to manipulate or support the share price if you were properly financed and so inclined. This might also explain the phenomenon that there is usually significant support for the stock even after negative news breaks. The stock usually takes a bit of a hit on the announcement and moves up a bit on lower volume days, irrespective as to what the market does. How long will it take and what will happen? To state the obvious, these things are complex. If there is indeed a fraud brewing, it's almost impossible to catch. Rating Agencies, Public Accountants and the SEC are nearly powerless to challenge management representations without a whistle-blower or insider-witnesses participation in the investigation. Allow me to meander around for a few paragraphs to illustrate how difficult it is for really smart, trained, hard working people to catch these things. "Because of its inherent limitations, internal control over financial reporting may not prevent or detect misstatements. Also, projections of any evaluation of effectiveness to future periods are subject to the risk that controls may become inadequate because of changes in conditions, or that the degree of compliance with the policies or procedures may deteriorate." 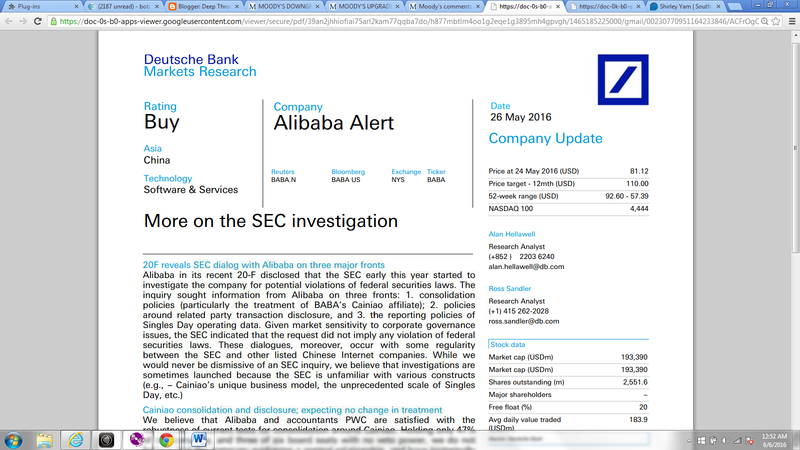 Interestingly, the day after Alibaba announced the SEC investigation, Moody's issued the obligatory press release stating that, in summary banker-speak ,everything is probably just fine. "If the SEC determines certain reporting requirements were violated, this would likely result in a restatement of Alibaba's financials, as well as in fines and shareholder lawsuits. In addition, any significant restatement would bring reputational damage to the company. The rating could come under pressure if Moody's concludes Alibaba's financial performance and credit strength are significantly weaker than previously believed. However, at present Moody's views this scenario as unlikely in the absence of substantial restatement implications that there has been material misrepresentation." Putting this in perspective, in just one day, with presumably no actual knowledge of what the SEC is actually looking at, Moody's fully reviewed more than two years of their own research and immediately concluded that everything they've done so far is absolutely error free. It's amazing how much work they accomplished in just one day, don't you think? The downgrade came the day after the bankruptcy filings of a number of Enron's subsidiaries. As usual....the rating agencies were right on top of it.....Ooooppsss. Another of my Favorite "Investigations"
On or about January 11, 2002, Gruttadauria sent a letter to the Federal Bureau of Investigation in which he stated: "During the course of the past 15 years I have caused misappropriation through various methods which resulted in other violations. It has occurred at Lehman Brothers, SG Cowen Securities Corp. Cowen & Co., Hambrecht & Quist, Inc. and LF Rothschild Inc." He continued: "It is a complicated and substantial interwoven fabric of digressions [, which] . . . . began as an attempt to make up lost monies for customers and mushroomed over the course of time." After he sent his letter, Gruttadauria disappeared. On January 25, 2002, the Office of the U.S. Attorney for the Northern District of Ohio obtained an arrest warrant against Gruttadauria. On February 9, 2002, Gruttadauria surrendered and is in federal custody. It's a long story and an interesting read if you have the time . When the dust cleared, it turned out that Frank was perhaps the worst investor in history and a really bad crook to boot. His scheme was simple, confiscate client money for his own personal use, "invest it" in leveraged, high risk bets and issue fake statements to his clients showing out-sized gains. At the time Frank wrote the letter to the FBI, total assets available to clients were $1.8 million and the fake statements showed more than $278 million in nonexistent assets. The "who's who" of Cleveland Investors were bamboozled. Frank was ahead of his time. He was a mini-Madoff in training. As you might suspect, after only fifteen years, the SEC was all over this fraud. The investigation commenced as soon as the FBI forwarded Frank's confession letter along to them. As I may have mentioned before, the SEC, Public Accountants, Bankers and Rating Agencies Investigative prowess seems to be at their best immediately after the voluntary confession hits the media. 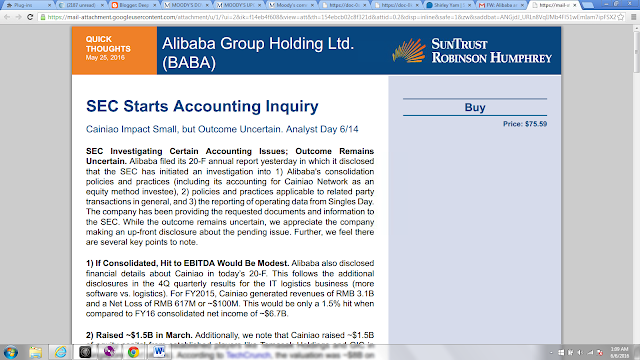 One of my readers, and a correspondent at the South China Morning Post (an Alibaba Company) also sent me an "all is well" email.citing "independent" opinions from Morgan Stanley, Suntrust and Deutsche Bank (and to borrow a phrase from the Alibaba disclosure "and others"), whose logos, by pure coincidence, were prominently splattered all over the front page of the Alibaba IPO. Again, like Moody's, these underwriters, with significant skin in the game, reputation risk and presumably no knowledge of the specifics of the investigation, have completely reviewed all of their work in just a few days and predictably determined, in Kevin-Bacon-esque style, that "all is well". I'm extremely flattered that the South China Morning Post would take the time send me these "independent" opinions of the financial condition of their parent company and their assessment of the outcome of an investigation that, by its' nature, they can know absolutely nothing about. SEC - BST: "So you are making the loan to the partnership owned by Simon, Jack and Yuzhu Shi? The partnership is going to buy the stock of Wasu media? That's the same Yuzhu Shi, the guy who went bust trying to build the tallest skyscraper in China (that was never actually built) and then took a video game company, Giant Interactive public on the NYSE, raised $1 Billion on the IPO, milked it for all it was worth and took it private in China at a deep discount with US Shareholders left holding the bag? .......is that the same Yuzhu Shi that you are jumping into bed with on both Wasu and Yunfeng Capital?? And you don't see any conflict of interest here? Really?" 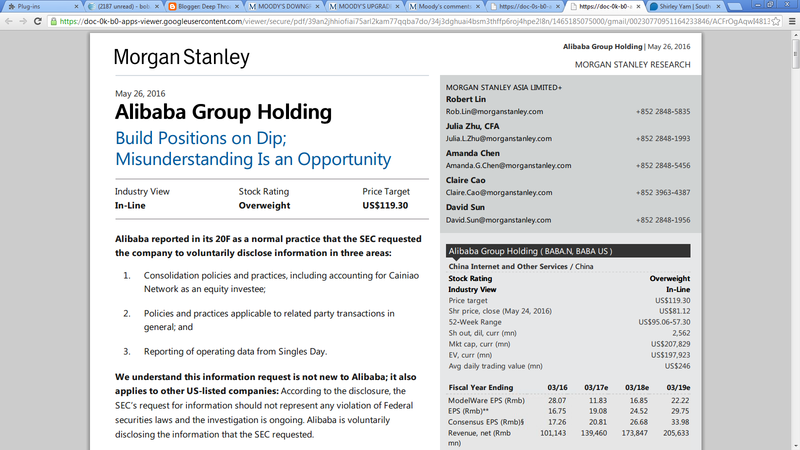 If we perform a text search of the IPO Correspondence above the word "Cianiao" doesn't even come up once. Apparently, this "rising star" wasn't even on the SEC's radar prior to the IPO two years ago. Yet, it's a primary focal point of the recently announced Investigation. Here's the disclosure from the recent 20-F (Buried on pg. 76 & 77) As a point of reference the word "Cianaio" appeared 108 times in the current filing. Cainiao Network completed a round of equity financing of approximately RMB10 billion (US$1.5 Billion) in March 2016. Existing shareholders and new investors, including major sovereign wealth funds and private equity funds, participated in the financing. We subscribed for Cainiao Network's shares on an approximately pro rata basis. As of March 31, 2016, we own an approximately 47% equity interest in Cainiao Network. See "Item 5. Operating and Financial Review and Prospects — A. Operating Results — Recent Investment, Acquisition and Strategic Alliance Activities — Logistics — Cainiao Smart Logistics Network Limited." Here's some more....."Through the platform approach, Cainiao Network integrates the resources of logistics service providers to build out the logistics ecosystem. As of March 31, 2016, Cainiao Network's fifteen strategic express courier partners employed over 1,700,000 delivery personnel in more than 600 cities and 31 provinces in China, according to data provided by them. Collectively they operated more than 150,000 hubs and sorting stations. The top six of these express courier partners handled the delivery of the majority of packages from our China retail marketplaces in the twelve months ended March 31, 2016. We believe that orders from transactions generated on our marketplaces represented a significant portion of these express courier partners' total delivery volumes in the twelve months ended March 31, 2016. Cainiao Network is still in an early stage of development. It has yet to monetize the majority of the value-added services it provides under the assisted-delivery model." "During the twelve months ended March 31, 2016, Cainiao Network and its logistics partners enabled the delivery of 12.2 billion packages from our China retail marketplaces. Currently, Cainiao Network primarily derives its revenue from end-to-end logistics solutions and generates a significant portion of its revenue from providing these services to Tmall Supermarket." Hmmmmm......this is the first 1,700,000 employee "enterprise" that I've run across that is in the early stages of development and has yet to "monetize it's value". Normally, when you are managing 1.7 million people you have some idea as to how to generate a profit. 12.2 Alibaba Billion Packages Delivered. 10 packages for every man, woman & child in China last year. 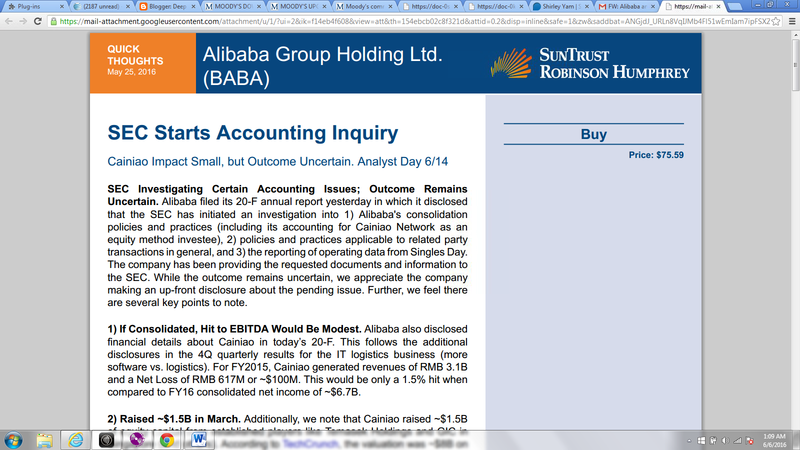 Alibaba owns 47% of Cainiao. Equity method accounting required Revenues and Income/Loss be consolidated at 47% of the above revenues and losses. Now lets have some fun with ratios! Cainiao Revenue per "employee" is US$280 per year. Cainaio packages delivered per day per employee is 33 (at 20 Billion Packages). Alibaba Revenue per "employee"is roughly $450,000/yr. Alibaba GMV per employee is roughly US$13.8 million per year. Based on the above, if economic theory holds true in China, you'd think that more than a few of the Cainiao employees would frantically filling out employment applications to get a job at Alibaba. There would simply be more money available to pay them. Again, I'm not an expert at Chinese mathematics, but I'd guess that $450,000/yr. is still more than $280/yr., even in China. How could this rate structure even exist? Two (2) cents per package wouldn't be enough to pay for the electricity to power the computers for the Cainiao "ecosystem", much less pay for the rest of the overhead involved. Would a price increase really be so hard to push through? Maybe go up to 4 cents per package and double the revenue? Presumably, all of the buyers, sellers and delivery businesses are somehow exchanging payments with each other through the Cainiao network. Does the money stay in the system to provide additional float? Does Cainiao hold the money for an extended period of time? How does this work? But again, the disclosure is so lacking that we have no idea how this presumably significant business, appearing virtually overnight, magically valued at $6.2 Billion in the 20-F operates or functions. There's a chance that the actual cost to deliver 12.2 Billion packages might be s hair more than 2 cents each. Where are these costs? 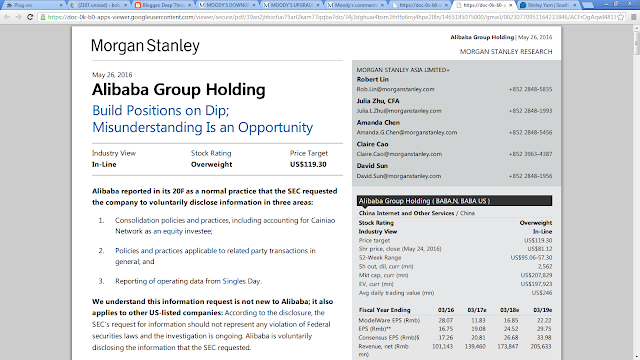 Were any securities laws violated re: the "Cainiao Round of Funding"? They took care in mentioning that the subscription of shares was "approximately pro-rata". Who got paid? Was it an illegal transfer of shareholder money? Of course, the very existence of the above described discussions in an SEC filing should ring the alarm bells and strike fear in the heart of any Investor. The level of disclosed insider self dealing is unprecedented. I can't even imagine the level of the potential undisclosed chicanery taking place. How could anyone (other than highly compensated lawyers like Simpson, Thacher & Bartlett, paid handsomely to zealously represent the interests of their client) possibly argue that the basis of any of these convoluted transactions or relationships could be in the best interest of US Shareholders? The couple of examples above are the most egregious but most likely just the tip of the iceberg. The responses to SEC questions in the pre-IPO documents are a nice window into how the investigative process works. As we can see by the Wasu disclosures (i.e. Shareholders taking it "up the Wasu".) that the SEC either lacks the will or the political clout to stop any of this.....but they will, of course, continue to ask excellent questions! If I were a betting man, as per past experience, the SEC will continue to ask direct, pointed, intelligent questions, Alibaba will continue to give absurd, confusing ridiculous responses and the dance will go on. Investors will continue to read (or not read) the correspondence and try to parse the meaning of Alibaba Counsel's cryptic answers. But, as always, the music will eventually stop and the dance will finally end when someone actually pulls the plug. It could be the unnamed PRC Bank seizing the pledged Wealth Management Products after Simon Xie's default. It could be US Investment Banks shutting off the capital spigot after really taking a hard look at the endless string of odd acquisitions and continuous thirst for financing which dwarfs "real" operating cash flow. It could be a few insiders, in an effort to do the right thing (and save their skin) filling out the whistle-blower forms available on the SEC website, fully documenting all of the (alleged) dirty little secrets buried in the bowels of the corporate records. In any case, just about anything could cause this silly house of cards to collapse. But what history tells us is certain, is that the SEC, Accountants, Regulators and Rating Agencies won't do anything meaningful until Investors are severely damaged by this mess. They will need to see the "confession letter" to change their inherent bias. The inevitable, can always be delayed, but it simply can't be stopped. So my question is: As an investor, there are so many places out there to park your money. There are growing, thriving, well run honest businesses listed on exchanges all over the world. You can park money in any of these stocks. You can hold cash, mutual funds, bonds, ETF's etc. You can put money in your mattress. There are more investment alternatives than ever before. 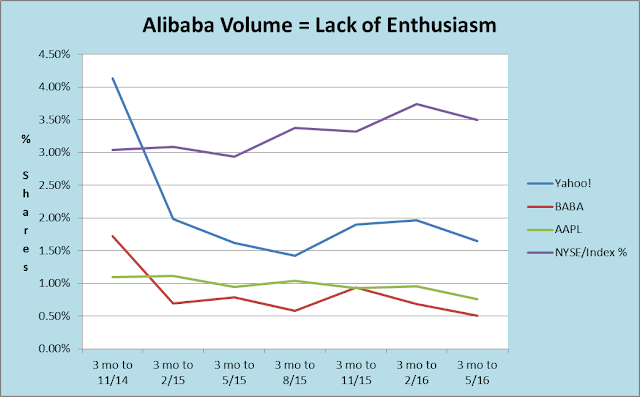 So why in the world, as an investor or a banker, would you put your hard earned money in the Alibaba ADR?